While excavation on the site of 432 Park has been ongoing for several months, no foundation work had yet been completed. This morning marks the first laying of rebar for the base of the building, a major milestone and yet another sign that the building’s rise is imminent. 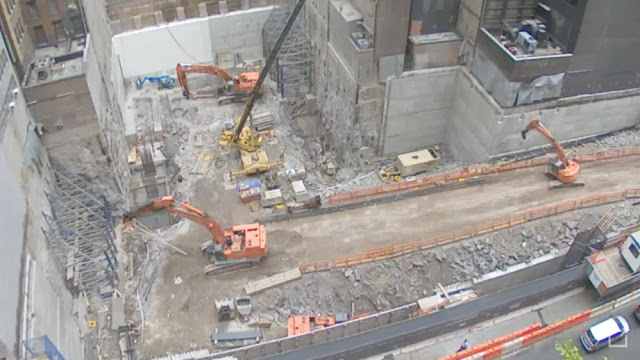 The work on rebar is visible on the northwestern corner of the site, and the retaining walls have almost been completed as well. With foundation work now formally underway, 432 Park should be at street level within several months. The only similar tower in the city–One57–rose to grade fairly quickly, although financing issues paused the actual building’s rise several times through construction. The simplicity of 432 Park’s design could mean that the tower will rise even faster than One57 has, meaning that One World Trade’s reign at the top of New York’s skyline could be over as early as 2014. While speculation is unreliable, CIM still hasn’t released detailed renders of 432 Park, which leaves Department of Building permits as the only source of information on the project. If CIM takes a tact similar to the one Gary Barnett used with One57, detailed renders will remain undisclosed until the building is well under construction, as competition for the high-end residential market in New York is extremely fierce. CIM’s tight-lipped approach makes even more sense in light of Gary Barnett’s confirmation that 225 West 57th will rise 1,250 feet (or higher), as views are one of the key drivers of the northern Midtown residential boom.